The business of a mom’s life can be overwhelming at times especially when she is trying to be a mother, house cleaner, cook, and on top of that a blogger all at the same time. But you don’t have to let your blog suffer just because you don’t have the time to write a new post, keep on reading to find out how you can get great content for your blog without having to write it yourself and what’s more it is completely FREE! When life is busy, writing quality content for your blog can be a chore in itself and generally gets put aside to make time for more important matters of the household that are always on a mom’s mind. Yet if you don’t put fresh content your blog is sure to suffer. You also have a commitment to readers to provide them with new information in line with your blog’s topic. To not provide fresh content would be at a risk of losing some of your readership, not to mention your rankings in Google. So the question is, how can a busy mom with a hundred other things on her mind publish fresh content on her blog when she doesn’t have time to write it? Yes, this is a big problem but don’t just throw up your hands and call it quit. Keep reading and I am going to show you how you can save your blog today. Though the problem is great, there is a remedy! The solution is called guest posting. Guest posting is a great way to get fresh and unique content for your site because number one it is easy and number two it is completely free as mentioned before. With guest posting, another writer writes an article about a topic in your niche and then allows you to publish their unique article on your blog. Generally speaking the only thing you give in return is a link back to that person’s website. So in all reality they are helping you by providing you with fresh content and you are helping them by providing them a link on your website which all your readers will see. As you can see guest posting is great for busy mom bloggers who don’t have the time to sit down and write a unique article at the moment but still want to keep their blog up to date with fresh content. If done right it is also an effective way to increase your blogs credibility and your rank in Google. It’s easy! First off you should start by placing a page on your site with the requirements for people who wish to publish their article on your blog. On this page you should also put a contact form so they can get in touch with you and send you the article. But the real reason I wrote this post was to tell you about a secret tool I have discovered that makes guest posting even easier. This tool is called MyBlogGuest. The MyBlogGuest community is the site to go to if you are looking for unique content to post on your blog. Here both guest authors provide content to bloggers who are willing to publish it on their blogs in exchange for a link. MyBlogGuest is free for bloggers to use where you will find articles, Infographics and other great content for your blog. Basically with this site you submit offers to publish articles that you find in the “Articles Gallery” adding a short message to the author and the time frame in which you plan to have it published on your blog. MyBlogGuest is a community of thousands of authors and bloggers and is a great tool to help you easily get started with guest posting. The site has lots of features including a forum, a WordPress plugin to help you easily publish posts on your WP blog. It also has a private messaging feature which allows you to connect with other authors and build lasting relationships. 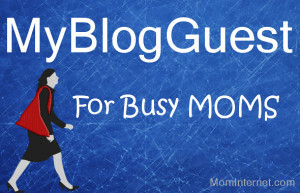 Guest posting is both free and easy with MyBlogGuest and is a great tool for busy moms. 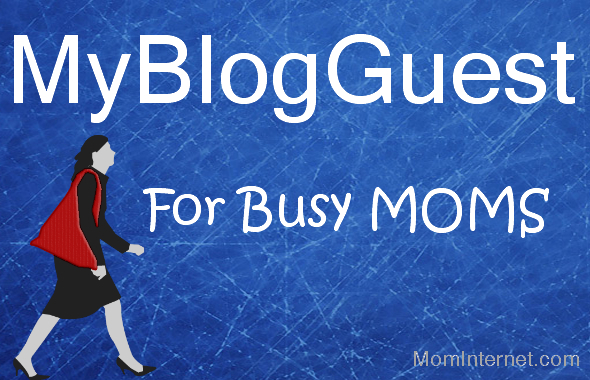 MyBlogGuest allows moms to rest at ease and take care of what they need to in the home without having to worry about their blog suffering. Tagged get free content, guest blogging, MyBlogGuest. Here is a book I enjoyed writing. I have been an eBay seller since 2000 and I have been hooked ever since. Where else can you sell ten earth worms for $10 plus shipping. Or how about carboard cutouts? 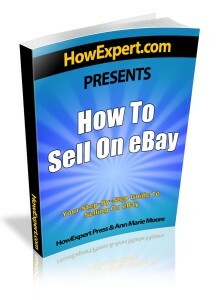 With a little creativity, basic research skills and desire to learn you can start selling on eBay with the tips I share with you in this book. One of the saddest times a mom will face is the loss of her own child. Even in the midst of death there is hope. Hope to continue on and allow this time to be filled with purpose. 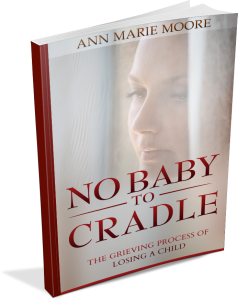 No Baby to Cradle is my own personal journey where I share the faith that helped me endure through deep sorrow. Giving me a renewed hope. Opening my eyes to others, reaching out, helping and being a blessing to them in memory of my precious little ones. 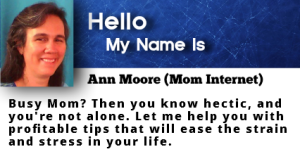 © 2013 Ann Moore (Mom Internet). All Rights Reserved.